Last Friday I promised the recipe of the dessert I was making and taking to my mom's place for dinner. Well, here it is today! The recipe I use for Ras Malai. Now Ras Malai is traditionally a Bengali sweet dish (originally from Bengal, South-East India. Coincidentally, my dad's family hails from there, the city of Kolkata - Calcutta in the past). 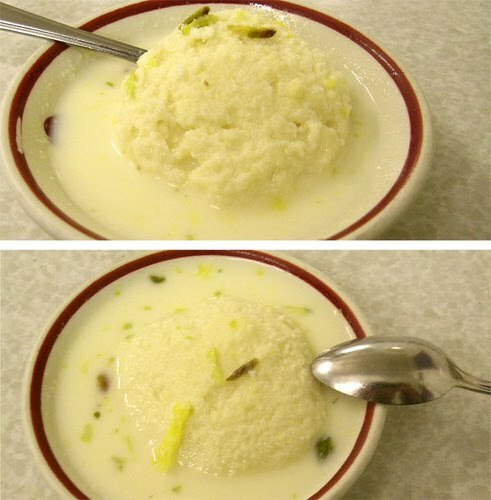 But ras malai is also very popular all over India and Pakistan, a favourite sweet dish and dessert of all the Indian Diaspora around the world too. - Place water, milk powder, sugar, cardamon powder, vanilla essence and almonds/pistachios in a deep pan. Bring to a boil, lower heat until the mixture barely simmers. - Mix milk powder with baking powder and the egg until it forms a thick, cloying ball. - Taking two teaspoons, form small balls of milk powder/egg mixture and place in the boiling milk. Allow the balls to puff up until they resemble fluffy little clouds (usually 8-10 minutes). Remove 'clouds' with a strainer, place in a deep bowl. Tip to make the balls - take a teaspoon, scoop half-teaspoon size of the paste, using the other teaspoon scrape and roll until the little ball is formed (exacly like what you do with spoons and ice cream). This amount of paste should give you about 20-25 small balls or more. Boil only 10 or less at one time so they all have space to expand in the pan. - Once all the balls have been turned into clouds, pour a third of the boiling milk mixture into the bowl holding the 'clouds'. - Return remaining milk in pan to the boil. Add evaporated milk and remaining sugar (you can use less or more sugar if you want). Stir and cook over low, simmering heat until the mixture starts to thicken. - Dilute custard powder (or other starch) with a few Tablespoons of water and add to the milk. The cream should thicken more now. - Remove from heat. Stir in the dairy cream. - You can already mix the 'ras' (cream) with the 'koftas' (clouds) and place in the refrigerator. Or you can place both dishes in the fridge and mix/assemble just before serving. - This dish should be served chilled. Place a few slices of almond/pistachio on each 'cloud' for garnish. You can also add a few strands of fragrant saffron. My aunt makes the traditional Ras Malai using curdled milk. She boils milk, when it's boiling, she adds lemon juice to it. Once the milk curdles, she strains in into a thin cloth and lets the curd hang for at least 4 hours. She then makes little balls using the curd which she uses in place of the milk powder/egg mixture I use. Another good tip for this recipe is it makes delicious ice cream! I often make this dish in summer and freeze the 'ras' (cream) in small tubs or in popsicle moulds. My kids love this treat! There you are - Ras Malai as we have it at my place! Enjoy! THat should be very yummy!!! Lol Tatiana! It is. My dad asks me to make this at every family gathering, and when summer peeks in, the kids are always on my back to get their 'homemade ice cream'! Hope you'll get to try it. Great blog you have here but I was wondering if you knew of any community forums that cover the same topics talked about in this article? Id really love to be a part of group where I can get feedback from other knowledgeable people that share the same interest. If you have any recommendations, please let me know. Appreciate it! Sorry this is so late - thanks for coming over and for the comment.